Who's got the remote control? Whisper it softly, but televisions showing news, timetable updates and adverts could soon be appearing on trains across the country. Music to the ears or an assault on the senses? Rail commuters fed up with shouts of "I'm on a train", the hum of music players and mobile ringtones now have another challenge - televisions. Central Trains is the first commuter route to install a blend of news, sport, features and adverts - joining Heathrow and Gatwick Express trains - and it claims to have an 80% approval rate. It won't say how much money it is making from it, but a spokesman says passengers and the train operator are not paying a penny. Others are set to follow, with c2c in Essex testing the technology, and Southern, One and Arriva Trains Wales are showing interest. This has stoked fear among some of their passengers who predict a noisy end to that hinterland of calm between bedtime and work. But what do they have in store? The answer can be found on Platform 4 at Coventry station, where the stopping service to Birmingham New Street has passengers who have endured or enjoyed eight months of the new entertainment. The first impression is disinterest, despite Trevor McDonald interviewing Condoleezza Rice a few feet above their heads. The screens are set high at the end of each carriage (except in designated quiet zones), with speakers fitted under the luggage racks. The volume is erratic, depending on the conversations around you, but it's hardly a barrage of noise. 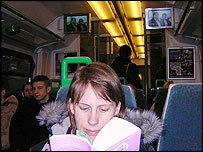 Are televisions on trains a good idea? Gary Fisher, 25, with his head in a book, thinks the set-up is sensitive enough not to infringe on his reading. "It's just news. If it was entertainment I'd not like it, but I think it's actually pretty good," he says. "I can choose if I want to read or watch it, if something catches my eye. My worst nightmare would be MTV or constant sport." So far on this journey, it's been constant news and sport, with not a commercial in sight. But that's not the case in the morning when features are screened on a loop, says another reader Debra Maton, 37, who travels every day from Coventry to Redditch. "I know some of the programmes off-by-heart - I can tell you all about monkey language and how humans should be using it. In a 35-minute journey you can see something six times, and if the train's empty you can hear everything throughout the train." After speaking to several more members of a generally happy audience, I find a quiet zone but it's empty apart from Leigh Talbot, 31, playing games on his Blackberry. Trying to escape the noise? Errrm, no, it was the only seat, he explains. Hardly a mass of dissent in the quiet zone, then. There is, though, an unhappy passenger, Dennis McDonnell, 44, sat at the back of a television carriage. "I don't like it. There's no escape from it because you have no choice. Of course, there are the quiet zones but sometimes they're full. "All day I deal with people on telephones and you get on the train and there's 10 to 15 minutes to gather your thoughts or read, but instead you're thrown into current affairs." His is a minority voice of rebellion on this train but one which chimes with the hostile noises being made in Essex, where televisions are being experimented with. Among them is an incensed Jon Yuill, the BBC News website's rail commuters' champion. "I have always said that one of the few compensations for the commuter is the fact that the journey time can be used for many different purposes," he says. "Quiet reflection. Reading a book or morning paper. Doing a spot of work, listening to relaxing music or simply trying to gaze out of the filthy windows on to the varied countryside. However, this is an insidious development which could be about to ruin this forever." Mr Yuill, who often has a 50-minute-plus journey into London from Essex on One trains, says it could even lead to an escalation of noise as iPods, voices, mobile phones and televisions all compete for supremacy. Tax accountant Natalie Guest is equally alarmed because she fears it will prevent her doing vital reading for work. She conducted an informal survey at work and out of 121 train users, 10% said they wanted on-train television and nearly half were against it under any circumstances. Jonathan O'Neill of c2c says: "We fully accept it's not everyone's cup of tea, which is why we offer passengers real choice, and 20% of each carriage will be quiet and speaker-free." But a national campaign called All Inclusive Platforms intends to fight the plans and boycott advertisers. One of its organisers visited Central and concedes its televisions were quite discreet but fears those elsewhere in the pipeline are far more intrusive. Sensitive to this kind of opinion, First Great Western is conducting a trial this summer of airline-style individual monitors where passengers can choose television, games, internet access or.....peace and quiet. Here is a selection of your comments. The debate is now closed. Commuting is an odd concept - only those who do it understand its peculiarities. The people who share my train to work usually take advantage of the hour-long chance to have some peace and quiet, reading their papers, snoozing or listening to their iPods. Nearly no-one talks, certainly not above a low whisper. Mobile phone users get funny looks if they disturb the morning calm - so I can't imagine what a host of unwanted TV screens would do! Leave us to enjoy our journeys in peace! I've travelled on trains in the US that have TVs, and I loathe them. I loathe them as much as I loathe muzak and the TVs in pubs and clubs. Dear god, is there no escape? What on Earth is wrong with a bit of peace and quiet? And why is this money being spent when it could go towards safety, cleanliness, and other improvements in basic services? They have a similar system on some of the metro lines in Madrid. I think if it is done professionally then it actually can be quite pleasant, things like brief news bulletins and weather always went down well with me. Making sure content stays fresh and contantly updated is key success I think. Where possible I refuse to travel on Central Trains services because of this incessant bombarding. Before this lame idea came into practice I was a regular traveller on Central Trains. Nobody asked me if I'd like to watch tv on the way into work. The quiet section of the train is less than half a coach so you're invariably forced to put up with the garbage shown. It's the worst elements of Ray Bradbury's Fahrenheit 451 and 1984 coming together. Shouldn't these train companies be concentrating on some of the more basic elements of their provision of a train service ie clean, punctual trains? Commuting in the South East is horrific enough without having a television blasting out when you are trying to sleep or read. As for saying that quiet carriages are provided - has that person ever travelled on a rush hour train from Essex - you sit/stand wherever you can get on so choosing the quiet carriage is not an option. It is a total waste of scarce resources. There have been TV screens on the Heathrow Express for as long as I can remember. Passengers on the 15 minute journey from London Paddington to Heathrow airport are shown a news bulletin from BBC World and a wildlife film. The BBC World news bulletins are updated daily. However, Heathrow Express have been showing the same wildlife film for at least six years! I think that they're a great idea, free me from the boredom of four-hour long journeys I have to endure. Perhaps not make everyone listen to it though, it is nice to get a bit of peace sometimes or to rest and sleep on a long tiring journey. Individual monitors with headphones showing popular programmes such as EastEnders or Friends would be great! Or even showing all the programmes on normal television at that time. Brilliant. We've put up with years of awful tinny speakers on trains not even up to the job of announcing the next stop intelligibly. I bet that now someone important to the TOCs (ie a company with a big advertising budget) demands decent sound quality, they'll get it, pronto. So much for "public service"! I'd much rather listen to the news than be fully briefed on the previous nights sexual exploits of Essex girls. TV on trains could be a good idea if they were similar to airline seat back entertainment units with headphone sockets. However in this case, having no choice but to watch what the train operator shows is bound to cause annoyance for some passengers. It also raises the question of how long will it be before the screens are showing non-stop advertising? The number 83 bus in west London has televisions on board, but they are subtitled. Generally they show "classic" comedy clips or documentries, but without sound so they are easily ignored by those wishing to admire the view of the Hangar Lane Gyratory. Why on earth would I want to be bombarded with current affairs, news and who knows what else on my commute to work - my working day and often enough my train journeys are stressful and over loaded, this is too much - no way! I have recently written to my local MP (Nigel Waterstone) and asks that he looks at this issue. I, for one, have little choice but to use the trains to travel to work and the introduction of these pervasive little bits of media bombardment is, quite frankly, not wanted. As a regular user of Central trains services I find that the tv is a good way of passing time, but I would rather see the money being spent on improved services and cleaner trains. I've had to endure this on my regular commutes into Birmingham, and I choose to ride in the quiet zones. But I fear that TV is becoming more and more the opiate of the masses. 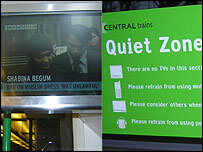 I have been on the Central trains with the new TV systems, and they are great in some ways but not so in others. In the busy mornings, you can't hear anything with the general bustle, so there is no point of them being there. But in the quieter times they are great, providing free news and weather reports, although some stories get repeated for weeks on end and every 15 minutes..... My only criticsm is, where are the louder speakers for the Blind? and the subtitles for the deaf/hard of hearing? Can these TVs tell you how late the train is running? And why!?! Now THAT would be worth watching! What a ridiculous idea! I don't have television at home, and certainly don't wanted it foisted on me while travelling. It's bad enough with mobile phones and 'personal' stereos without this kind of invasion. Is this country so sad that it's populace can't live without television for even a short period in the day?